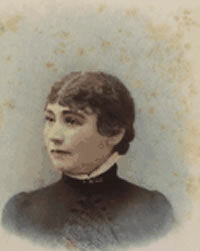 Sarah Lockwood Pardee was born in New Haven Connecticut abt. 1839, according to the 1850 census. Her parents were Leander Pardee, a manufacturer in New Haven, and Sarah W. Burns. In April 1862 in New Haven, she married William Wirt Winchester, heir to the Winchester Repeating Arms Co. Their only child, Annie, died as an infant. After his death in 1881 she removed to California, settling in San Jose in a small home, which she strangely began adding to. This after reportedly hearing from a medium back east that there was a curse on her family because of the Winchester Rifle. The only way to "appease the spirits" was to never stop building. Apparently, the number 13 was of special significance in the building process. Most of the stairs were 13 stairs - most of the windows had 13 panes - most of the walls had 13 panels and on and on. The building continued into 1906 - when the San Francisco area earthquake struck in April, the house was taken down from 7 stories to 4 stories, and Sarah was reportedly trapped in her bedroom. The architecture was strange, reportedly to confuse the spirits. Stairways led to nowhere. Doors opened into dropoffs, and chimneys were constructed that went nowhere. 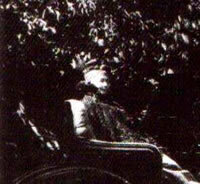 At age 83 in 1922, Sarah died in her sleep, reportedly after another seance. Of course, her will had 13 pages and she signed it 13 times. She is buried in Evergreen Cemetery in New Haven, Connecticut. When all was said and done, the Sarah Winchester house was composed of 160 rooms, with 40 bedrooms and 13 bathrooms, not to mention 6 kitchens, and over 40 fireplaces, all built at a cost of approximately 5 million dollars. The Winchester Mystery House in San Jose, California is currently open to the public for tours.